"My therapy at REA has dramatically improved my vision and coordination which was severely disrupted by severe brain injury when I was struck by a vehicle while walking in a crosswalk. I had extreme double vision and several other issues which seem to improve daily. I can now read, draw, and walk almost normally again. The care, expertise, and respect I have received have all been exemplary and astonishing." I was referred to Dr. Curtis due to having a concussion after a motor vehicle accident. I had never heard of this type of therapy, but I was open to try anything that could potentially get me back to my normal life. Dr. Curtis is very caring and put me at ease. He explained things clearly, and answered all of my questions. Most importantly, he made me feel like everything was going to be okay, and that I’m not alone. All of the staff (Holly, OT, Ect.) are very professional, and they also explained things clearly. I completed the 30 day program at the end of August. I’m slowly transitioning back to work. My symptoms are not completely gone, but I’m better now than I was five months ago. I had my 90 day checkup and he provided me with a three week light therapy plan at home that I’m currently doing. I believe I me Dr. Curtis for a reason. I have spoke to many people about his program, including my Primary care physician who is very interested in this therapy. This can benefit both children and adults. I feel blessed to have met Dr. Curtis and his staff, and to have participated in this program. I highly recommend people to at least meet him and get more information for yourself or your child. I believe that this has definitely helped. I used to not be able to do something simple as go to the grocery store without becoming dizzy and feeling sick. I have noticed an improvement. It is a slow steady process, but I am thankful I did this. It was great coming to a doctor who said “I know what’s wrong” It was very frustrating not knowing what was happening. Thanks to the Multi-sensory training my life is returning to normal. Instead of struggling with dizziness five to six days per week. I have challenges only one to two days per week. In searching for solutions for my daughters difficulties in learning to read I was incredibly fortunate to come across Dr. Steven Curtis. He was able to assess rather quickly the issues she was having with her eyes that were inhibiting a very bright child from learning to read. Dr. Curtis recommended vision therapy. The commitment to vision therapy gave my daughter life changing results. By the end of therapy she was not only caught up to grade level but soon exceeded grade level shortly after. Unexpected results were, her balance, and being able to finally ride a bike, play sports because of improved hand eye coordination. And her over active constant movement became that of a normal active kid. She developed over time more ability to sit and focus for longer periods. The benefits were immediate and continued to progress for about six months to a year. I found Dr. Curtis and his staff to be honest, caring, and of great integrity. If your child is having issues or has been “labeled” I highly recommend a consultation with Dr. Curtis. I was involved in a serious car accident in February 2016 at the age of 62. After 2 weeks flat on my back in bed, in a dark room on pain medication, I began the slow process of recovery. I only left my home for Doctor appointments and physical therapy for months afterward. I was constantly dizzy and light headed therefore restricted from driving. I went to several specialists, a psychologist for stress and trauma therapy, and physical therapy for the bodily injuries. The constant dizziness continued and on June 21st I fainted in my home, hitting my head resulting in a second concussion and re-injuring my neck. Months of physical therapy followed yet the dizziness and light headed feeling remained. Eventually, my Physical Therapists informed me that there was nothing more they could do to help me and felt there was a “disconnect” between my eyes and my brain. I was referred to Dr. Curtis for evaluation and his therapy for which I am very grateful!! In my initial meeting, Dr. Curtis and his staff performed many visual examinations and tests and determined I was a candidate for vision rehabilitation therapy. The first 4 days of therapy my symptoms did increase as Dr. Curtis prepared me they would. Thereafter, however I felt better each day. 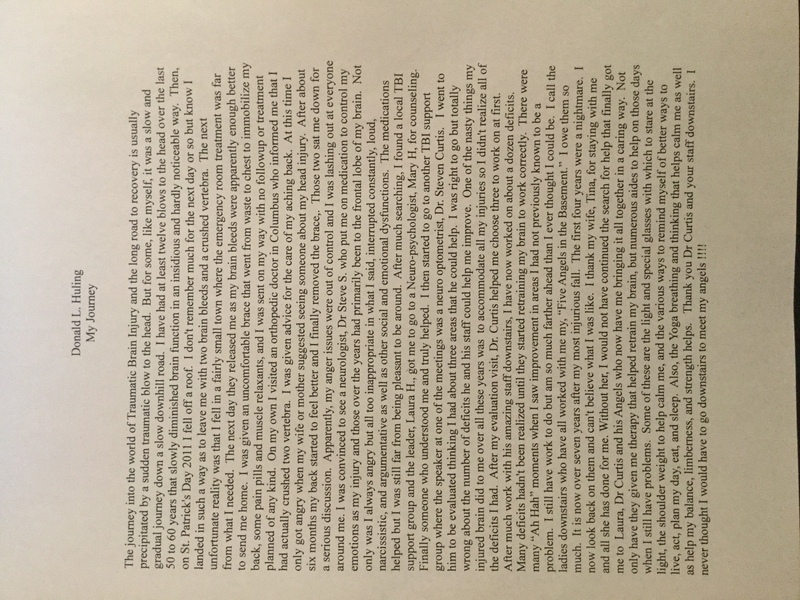 As I write this, I have completed 30 days of treatment and have my follow up appointment with Dr. Curtis and retesting today. I am looking forward to seeing how dramatically my test results will have improved! I did not understand how badly I felt until day six or eight of doing the “torture room” and I then realized I had my personality back. I was depressed, self-absorbed and pushing through my dizziness, confusion, fear of driving, and going to stores, and tired all the time. The SIT was painful at my left eye and left side of face for the first few times. I just had to have faith that it was ok to finish the time. Slowly I felt better with less dizziness, confusion, eye pain and at 90 days later I can see how far I have come. I have been driving 5-10 miles from home without difficulty. I can read more without eye pain and dizziness. Two weeks after the therapy I thought I was 90% better, but I still remember how bad it was. My mind is clearer. My dizziness is gone. I’m reading and comprehending better (in a quiet room) I feel like I have much of my independence back and I’m not waiting for another adult to help me care for me or my family.